This item was purchased by J. Paul Getty Museum, Los Angeles. 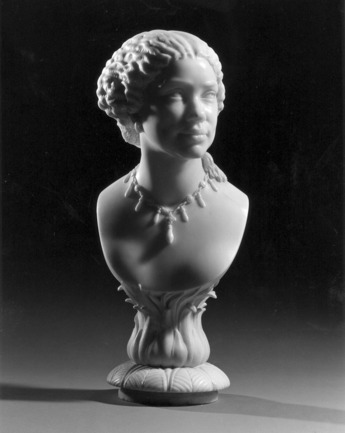 looking to her left, wearing a necklace and with a net to the back of her hair, on a naturalistic palm leaf socle and foot with stylised stiff leafage, signed ‘H.WEEKES A.R.A. Sc. 1859'. Literature :- The J. Paul Getty Museum Journal, Vol. 24, 1996, no. 91, p. 139. Mary Seacole (1805-1881) was a remarkable woman, who might justly be described as the other heroine of the Crimean War. She was of mixed race, brought up in Jamaica, and the best-selling book of her experiences, ‘Wonderful Adventures of Mrs Seacole in Many Lands' was published in 1857. This bust is like other portraits of her, notably a watercolour in the National Library of Jamaica, and a bust of 1871 by Queen Victoria's half-nephew, Count Gleichen, exhibited at the Royal Academy in 1872 and now in the Institute of Jamaica, but there is no firm evidence to allow a definite identification. 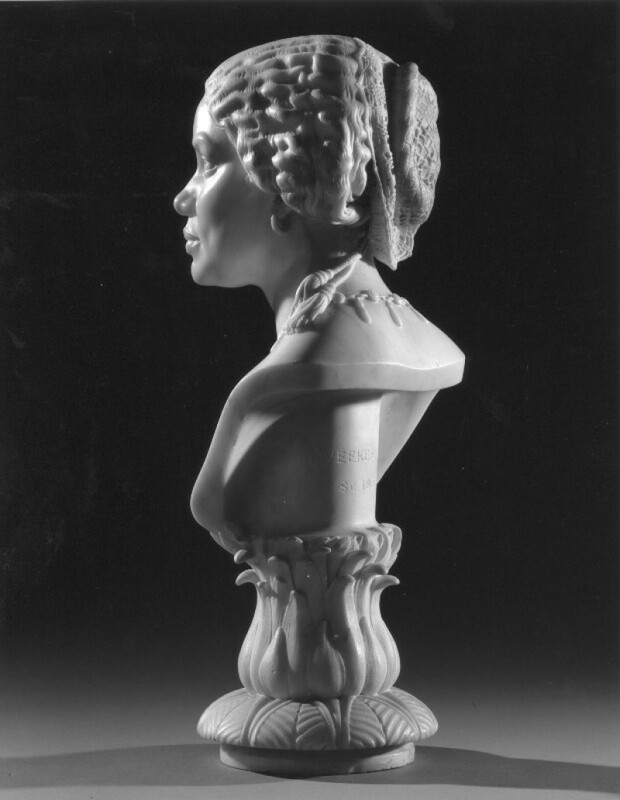 It would certainly be a rather idealised portrait, based on these and other known images, but it is surely significant that this bust seems to portray a woman of mixed race, like Mary Seacole, and that it is dated 1859, just two years after the publication of her autobiography when she was at the height of her fame. Henry Weekes (1807-1877), was a pupil of Sir Francis Chantrey and took over his studio in Buckingham Palace Road after Chantrey's death in 1841. He exhibited at the Royal Academy every year from 1828 until 1874, and again in 1877, was elected an Associate in 1850, a full member in 1862, and was its Professor of Sculpture from 1869 to 1877. This bust was probably that which was exhibited at the Academy in 1859 (no. 1321), entitled ‘An African Head'. In 1838 he was commissioned to make a bust of Queen Victoria, the first since her accession to the throne. In 1841 he made the figures of Cranmer, Latimer and Ridley for the Martyrs' Memorial in Oxford. In 1864 he sculpted the group which represents ‘Manufactures' at one of the corners of the Albert Memorial. Five works by Weekes are in Westminster Abbey, including the monument to Robert Southey.